St Mark’s Breakfast Club aims to provide a secure, affordable and welcoming facility for families attending the school. We are open on a daily basis in the Main Hall and children can arrive anytime from 7.30am until the start of school. We aim to offer a healthy choice of breakfast in a calm relaxed environment. 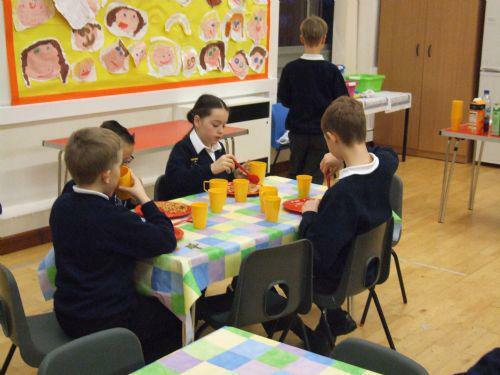 We encourage the children to be as independent as possible in making their healthy food choices as part of a balanced diet and be responsible for clearing away their dishes. Breakfast is served up until 8.20am. Pupils can choose from a selection of breakfast items, ranging from cereals, fruit, yogurts and toast with hot toppings, like eggs or beans. There are also fresh fruit juices, milk or hot drinks to choose from. Places are available on a first come, first served basis and will be secured at the time of payment. Parents need to book and pay in advance via the Breakfast Club during their opening hours. After their breakfast, children can enjoy a quiet table top game or colouring activity. They are encouraged to develop their social and interactive skills with pupils from across all the year groups. On different days there are opportunities for the breakfast club children to access the ICT suite, Explore room or outdoor games on the KS1 playground. The club is run by members of the school staff team so they will be familiar to the children. There are always at least two members of staff present. All the Breakfast Club staff are trained in First Aid and Food Hygiene and hold current CRB checks.